Its scary in the Jungle at night! The prompt this week at Illustration Friday is Jungle. I suppose I should have been finishing my icads off. I started out to do so but found myself doing this journal page. I think I have icaded myself out! It is strange I counted the postcards that I have done over the last few weeks – 23. I have done 40 icads. Figure that out! Ok the 40 are 5 x 3 index cards, and the postcards are 6 x 4 on card. But hey who cares, as far as I am concerned I have done 63 icads. They were all collages and whimsy! So that dealt with I can now quite happily go on and do whatever. I have to say that the icads have set me on a new path, so thanks for that Daisy. The above collage is based on my cat Bro who is afraid of the dark in spite of being Mr. Tough Guy! Don’t tell anyone but he likes birds and I think he would love to play with them in the jungle as they would protect him from the nasties! Here are some sketches I did of him earlier in the year. If I light the fire he is there! Sharon, these cats are marvelous! I LOVE them! Ha, these are so cute - I love that Bro is scared of the dark and like birds!! Got to love a cat drawing! You have really captured a personality there! wonderful cat sketches today Sharon! 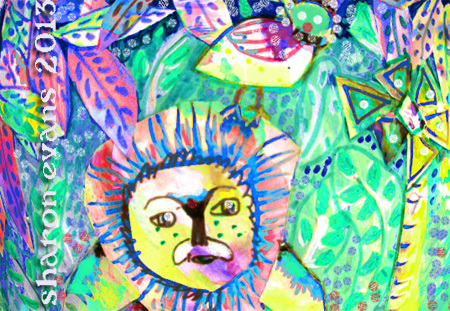 Love the colors in the jungle piece! Adorable drawings of your cat! I really like the one in front of the fire. I loved this with your fun cat art!! I love how you portrayed his lion like nature!! Very sweet and fun!! Love the one in front of the fire and the one talking to a friend!! Good job... So fun! I love your whimsicalcat drawings and your journal page. Lovely colours and detail.